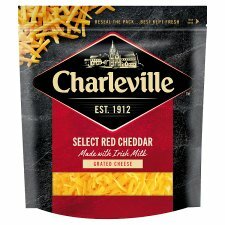 At Charleville, we're taking a stand to banish the bland! Tip tortilla chips on to a baking tray, pour over zingy salsa, scatter over chopped spring onions and a pinch of dried chilli flakes, then sprinkle liberally with Charleville Freshly Grated Select Red Cheddar. Finish in a hot oven until melty & delicious!